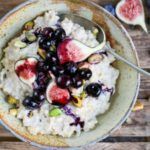 Brown Rice Porridge with figs, blueberries and pistachios. A healthy breakfast that's a little bit different. I thought it would taste weird, but it's really good! Place the brown rice, vanilla extract and all but 120ml (1/2 cup) of the almond milk into a large saucepan. Bring to the boil, turn down the heat and simmer on a low heat (without a lid) for 40-45 minutes. Stir every 10 minutes. During the last 15 minutes the almond milk will reduce significantly. Top up with the rest of the almond milk at the end if required. Just before the porridge is ready, place the blueberries and 1 tsp of water into a small saucepan. Heat on a medium heat for 3-4 minutes until the blueberries just start to release their juice. Turn off the heat. Divide the porridge between four bowls. Top with the blueberries, figs, pistachios and a drizzle of honey.